The wait is finally over for hockey fans across the globe, as the season is in full swing. For the Quinnipiac Bobcats, they hope to get back to where they were two years ago, after failing to make the NCAA tournament for the first time since 2012. The team returns a strong group of defenseman, led by junior captain Chase Priskie. A Washington Capitals pick in 2016, Priskie put together an impressive sophomore campaign last season, registering seven goals and 19 assists. The Bobcats bring in another offensive-minded defensive like Priskie in Boston University transfer Brandon Fortunato. After sitting out a year due to NCAA transfer rules, Fortunato’s high hockey IQ and ability to run the power play will be of much help, as Quinnipiac finished the 2016-2017 season with a power play percentage of 18.3 percent, ranking 32nd among teams in the ECAC. With Priskie and Fortunato likely to be the first pairing, guys like Brogan Rafferty, who led the team in assists last year (22), and Kevin McKernan will also be counted on heavily. Right now, the Bobcats look to have a very deep defensive core this season. 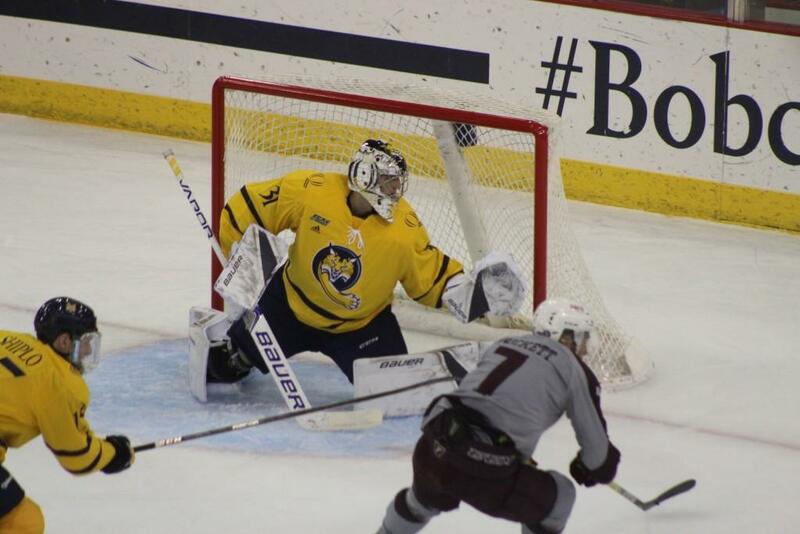 In the cage, Quinnipiac could have one of the most lethal goaltending duos in the nation. Returning starter Andrew Shortridge is looking to build off of a strong freshman campaign. Shortridge won the starting job last season after entering as backup to Chris Truehl, and posted a 13-7-0 record with a 2.08 goals-against average and a .920 save percentage. While it is still unsure as to who the starter will be, it is certain that whoever Coach Rand Pecknold puts in will give the Bobcats a good chance to win night in and night out. Then there’s freshman phenom Keith Petruzzelli, coming in as one of the most prized recruits in the nation. Drafted in the 3rd round by the Detroit Red Wings in this year’s NHL Draft, Petruzzelli is one of the highest regarded prospects that Quinnipiac has landed in recent memory. The Wilbraham, Massachusetts native was named USA Hockey’s Goaltender of the Year, after putting together an impressive season with the Muskegon Lumberjacks of the USHL. He finished the season with 22-10-1 record, to go along with a 2.40 goals against average and .918 save percentage with Muskegon. The competition between the two goalies should bring out the best in them, with nothing being guaranteed as to who will emerge as the starter. Up front is where Quinnipiac’s biggest concern is as we enter the season. The team had a difficult time replacing guys like Sam Anas and Devon Toews last season, and have lost some key forwards from last year’s team, especially at the center position. Tim Clifton and Tommy Schutt took the majority of draws last season, so faceoffs could be an issue early on. The Bobcats do bring back leading scorers Landon Smith, a senior, as well as junior Craig Martin. Senior Bo Pieper will also be counted on heavily this season after tying with Tim Clifton for the team lead in goals (13) last year. As for newcomers, freshman Odeen Tufto from Chaska, Minnesota is someone who can make an impact right away after impressing in the preseason game against Saint Mary’s. At 5-foot-8 and 174 pounds, Tufto is an undersized player, but makes up for it with his offensive skill set and relentless physicality. It is very likely that he could open the season centering the first line after playing alongside Landon Smith and Bo Pieper in the exhibition game. Also be on the lookout for senior Tanner Macmaster, who lead the Bobcats in shooting percentage (14.8 percent) last season. With the strong defensive core and stellar goaltending duo Quinnipiac has, they have a very high ceiling. With seven juniors and five seniors, the Bobcats are fully equipped with leadership and experience both on the ice and in the locker room. You might see a change in their style of play with the departure of the Clifton brothers’, who brought an edge to the team with some old-style chippy hockey. Now, Quinnipiac will be noticeably faster on the back end with the addition of Fortunato. A huge concern for the team is the forward group they’re rolling with. However, if a few players can step up in scoring this season and the defense can break the puck out of the zone effectively, the Bobcats may have a lot more success than expected. Quinnipiac ranked No. 14 in the USCHO Preseason Poll ahead of all other ECAC teams, except for Harvard (No. 4). They will have a good chance to compete for an ECAC Championship, and hopefully qualify for the NCAA Tournament. Harvard will likely be their most difficult competition in the league as the reigning ECAC Champions and an appearance in the Frozen Four. The Bobcats may have the best defense and goaltending in not only the conference, but the entire NCAA. If they can figure out the forwards and roll with a solid lineup, there will be no question this team will have yet another successful season. Follow Joe Bertolami on Twitter @BertolamiJoe.